Life is not a series of gig lamps symmetrically arranged; life is a luminous halo, a semi- transparent envelope surrounding us from the beginning of consciousness to the end. Sometimes the image finds the quote while other times the quote finds the image, either way I’m happy when I can find words that expand on what I’m feeling when I photograph. I remember the first time that I saw a halo and the geek in me rushed home to find out what created it. That was the beginning of my occasional e-mail chats with Les Cowley of atoptics, a man very generous with his knowledge, and the start of my passion for studying ice crystals in the atmosphere. These words today though, a semi transparent envelope, as it refers to life deeply resonate with me. 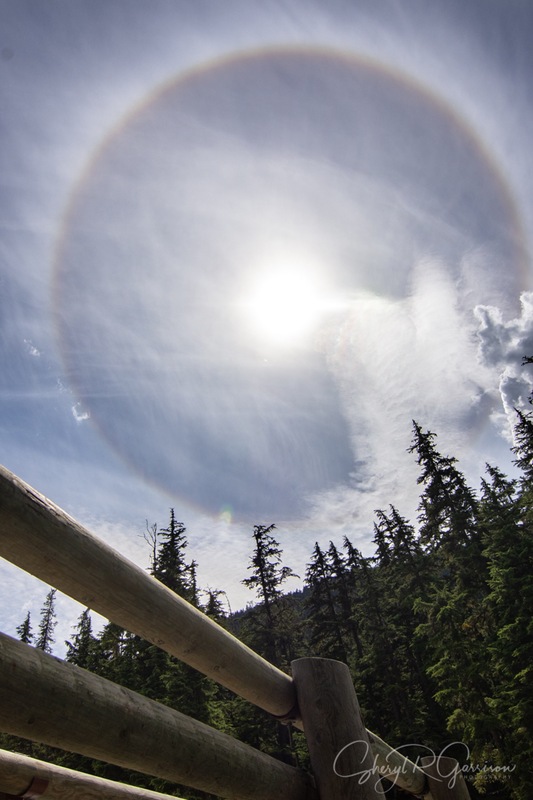 The 22 degree halo in this image appeared fleetingly as we drank from the waters where two glacial brooks converged. Don’t forget to look up, day or night, and let the luminous beauty of nature envelop you. Or in this case, something that I did not know before. This is an image from 4 years ago. It’s the one that began my study of halo and atmospheric phenomena. I was driving home as the sun was beginning to go down and spotted what I thought was a patch of rainbow. I stopped to photograph it and wondered why I should be seeing it alongside the sun, about a hand span to the left of it, and not opposite to the sun where rainbows occur. It would brighten then fade and I watched it until it disappeared altogether and the sun sank below the horizon. I couldn’t wait to get home and research what I had seen. Little did I know at the time that this would launch in me a passion for clouds and the ice crystals that can be found in some of them. This beautiful patch of color I discovered was created by horizontally oriented plate crystals drifting down through the sky. This is the sundog, parhelia, or “mock sun”. Sometimes they are seen in pairs on either side of the sun and sometimes they appear along with that full circle, the 22 degree halo, around the sun. Photographing daily has made me more observant and at the same time more inquisitive. My camera isn’t just a tool for capturing an image. It’s the catalyst for my exploration of the natural world. Where has your camera led you? and a thrilling email conversation with physicist Les Cowley. Do you ever wake up and just know that something is going to happen? Last Saturday I let the dogs out early in the morning and noted the appearance of some of my most favorite clouds…cirrus and cirrostratus. Those of you who know me well know of my love for photographing ice, snowflakes, and other crystalline structures found in the winter months so it’s only natural that these delicate clouds composed of ice crystal would draw my attention in the summer! These clouds are the ones capable of producing atmospheric phenomena like halos, arcs, and iridescent clouds. The first to appear was a 22 degree halo and iridescent clouds. As the day wore on and the clouds showed no signs of dissipating I started to feel excitement building that I might spot a circumzenithal arc, often called a grin in the sky as it looks like an upside down rainbow. As the sun began to get lower in the sky I walked outside scanning all parts of the sky and discovered the appearance of a sundog. And then I saw it…circumzenithal arc! Moving quickly I tried to capture as many views as possible but couldn’t quell a nagging thought that there was also something in those images that I didn’t understand so after the last light faded I came inside to research halos on my favorite site atoptics. I came to the conclusion that the secondary arc that I was curious about might be a tangent arc but hoping for some clarification I emailed Les Cowley (atoptics), retired physicist and atmospheric optics expert. I couldn’t have been more thrilled when I got a response back that began with congratulations, you saw two rare arcs-a supralateral and also a Parry arc. The Parry arc is named for William Edward Parry who diagramed this arc in 1820 while icebound on his search for the northwest passage. This lovely man also took the time to provide me with an enhanced, labeled view of my image. I’m not sure what surprised me the most, that I photographed these rare arcs or that Mr Cowley took the time to do this for me, a novice skywatcher who studies clouds and atmospherics in her spare time. One of those days that I will remember for a very long time and as I shared with Mr Cowley, I’m afraid that you may have just created a monster! His delightful response? Feed the monster…and I fully intend to! If you’re interested in these ice halos I would encourage you to visit http://www.atoptics.co.uk where you will find a veritable treasure trove of information.